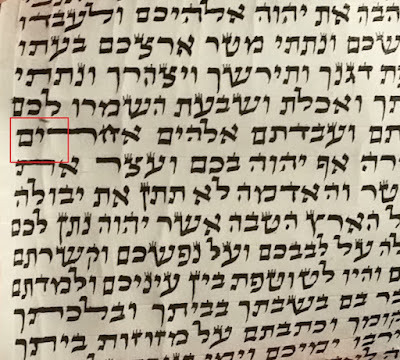 I think Reb Shmuel in his previous post may have accidentally reduced the size of the rosh when he pasted the white margin (of his kulmus image) a little over the bottom right of the actual rosh. If you look at the original image, there is a shpitz (and some body ) coming down on the bottom right and we measure the size of a rosh from edge to edge, as I did in my picture above. You could also argue that the ink between the two tagin on the left is part of the rosh, but I did not include it. Even if you do not include the shpitz, the extention is still less than half a kulmus. When I saw the original shailo, my gut feeling was that the regel had max 2 and 1/4 of the rosh in it. 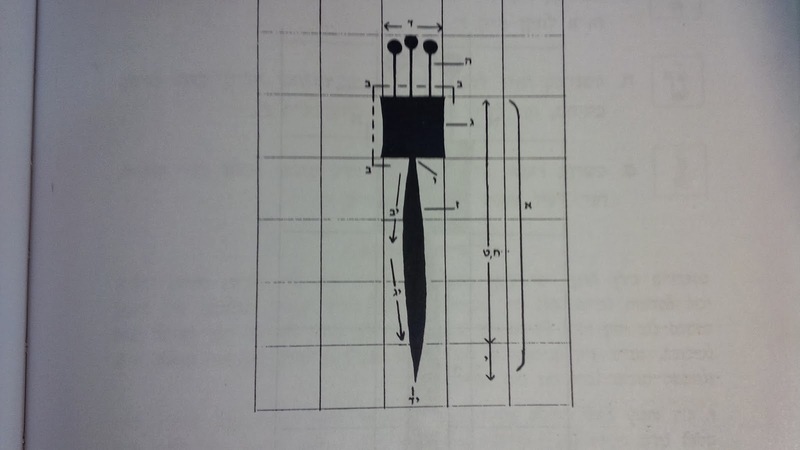 I blew up the zayin and used a graphics program with a grid to draw the red lines. The program pixillated the image a bit but you still get the idea. Moving on from Reb Shmuel's post to the general issue. 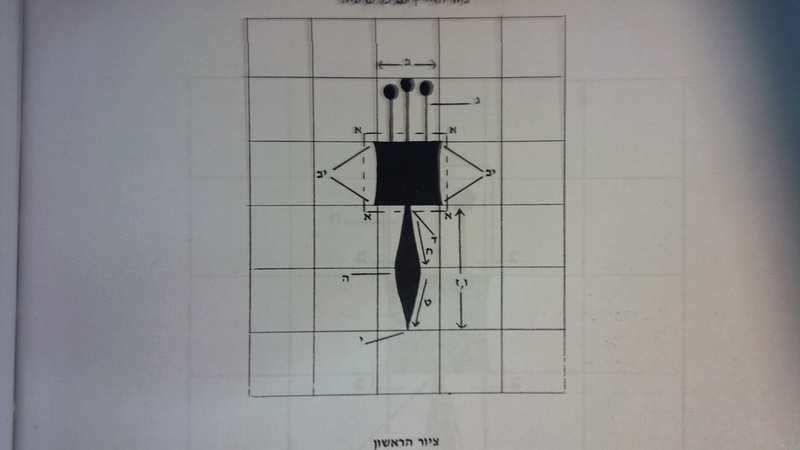 Below are the correct proportions for a zayin a and a nun pshutah, photographed from the sefer ksivah tamah. Look at the photo of the zayin, then the nun and let them both register. Then go back and look at the shailo. Rav Klien says that everything is relative to the ksav. If the sofer is making short nun pshutahs with only 3 kulmusim in the regel, then 2 and 1/3 kulmusim in a regel of a zayin (in a ksav where the zayins are normally even a bit less than 2 kulmusim) is a bit of a worry. I agree that you will not see much extra sticking down below the line in such a case. However IMHO (in my humble opinion) you cannot just jump on a zayin the second you see a regel that is sticking down a fraction lower . If the regel of the nun is 3.5 kulmusim (or more) I wouldn't look twice if the zayin was as above or even a drop more. 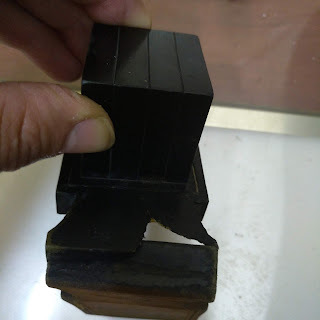 Also, if the head of a zayin is a little thicker for whatever reason, its possible the sofer deliberately went lower to compensate. Everything has to be looked at. Certainly, as Rav Klien says, on a normal / proportional ksav, the zayin above should present no problem. According to Rav Klien, its not really a shaylah (on a normal ksav) unless the regel was clearly at least half a kulmus longer than usual. I don't think this is the case here. I am leaving the arts and crafts aside -by now you all realize that we are splitting hairs on a Deoraita and we are working with blow ups and scans. In reality since the original is so small the difference between less than half a kulmus and more is very minute. 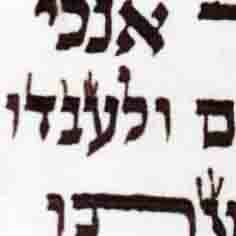 Size of a long nun is 4 kulmusim including the head which leaves us 3 kulmusim for the regel (Darkei Moshe 36-4). See the footnotes in Kesiva Tama(Silberger 5756) that since the Ksov Lechaim (minsker sofer -the first azus panim to pasul sfardi ksav and to pasul the ari tzadi. )writes it should have 4.5 kulmusim he made a pshara between the HOLY REMA and the Minsker Sofer. My point again is too bring attention that the Beraysa warns not to make long zayins and we are too lenient when the diference between kosher and posul is a chut hasara. I showed the image with the 5 Zayins (from the previous post) to Rav Friedlander. He pasuled the top right one and said the rest were fine.